The Relationship People's Blog: The dog is moving too. We are in the process of downsizing, which entails bringing some 20 years of accumulated stuff out of the roof and deciding what to hang onto and what to dispose of. Boxes and bags are constantly being moved around the house, out of the house and back into the house. 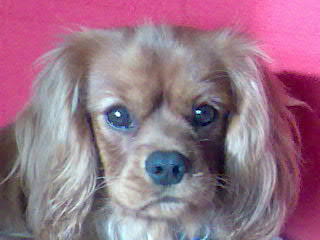 Rufus, our 4 year old Ruby Cavalier gets twitchy when we begin moving things about. Like many dogs he likes routine and things left where they belong. So imagine our surprise when the other day he began moving his toys from his toy box to the hall. He also decided to move a 'care bear' Jenny made for her daughter many moons ago, because we had put it at a height he could reach. We moved his toys back to the box so we wouldn't trip over them. 5 minutes later he had moved them back to the hall including the bear! Today normal service has resumed as we went out for our early morning walk with him, fed him breakfast and then settled down to work at the computers. He is now happily ensconced under my desk, snoring gently as cavvies do.